“You have me. Until every last star in the galaxy dies. So after months and months of people gently reminding me I needed to read this ASAP and me telling them I would but then actually procrastinating another few months… I finally read Illuminae. And I must admit, I kind of started this one verrry reluctantly. Even though half the world was telling me it was amazing. So why was I still so reluctant? So if you haven’t read Illuminae yet and share some of my worries, please still give it a try. Because it may surprise you as pleasantly as it did me. Here are just a few of the highlights to help convince you. The unique formatting. The first thing you’ll ever find out about this book is the unique formatting. Told through documents such as interviews, IM’s and military files, it is quite different to read than your average book, but it also really a joy to read. I even splurged to get the hardcover copy, because it’s just all so pretty and I love looking at it, okay? The characters. The characters are amazing and lovable and even though it is not told in a classic way, you still get such a great feel for these characters. Especially the main characters, Kady and Ezra, who I pretty much immediately fell in love with. Kady is such a great heroine, a badass hacker who is both tough and vulnerable and witty and OMG I love her and if I ever end up on a zombie-infested space-ship I would want her by my side. Ezra is such a sweet, lovable goof who is not afraid to show his emotions and is just hilarious and such a good guy and I love him so much too. Also, these two, together? I shipped them so badly, pretty much from the very beginning where they had just broken up and got separated right away. Yep. That’s what this book will do to you. But don’t get me wrong, they are not even close to being the only two characters to love here. I mean, I loved Byron. I loved McNulty. I loved Chatter. I loved the captains, even when they are making terrible decisions. Basically, I thought I’d have trouble connecting to any of the characters and I ended up connecting to basically all of them, which only spelled bad things for my poor, breakable, little heart. Because these authors love putting their characters through hell. And back. And back again. AIDAN. Alright, I need to talk about AIDAN separately for a minute here. Because my feelings for AIDAN are weird and complicated and so they deserve a little analysis here. Basically, AIDAN is the artificial intelligence, which suffered some damage during battle and ended up a little psychotic. And slightly evil. He does some things that make me want to either run and hide or shout at random people to just SHUT HIM DOWN ALREADY. But also, I want to hug him? And I kind of love him? Like, I want him and Kady to be a super badass little hacker duo, taking over the world. But I also want Kady to take him down a few notches? Basically, I’m questioning my own sanity. But I still want more AIDAN. The action-filled and super twisty plot. As I said before, I went into Illuminae almost blind. I knew it had unique formatting, was set in space and featured an evil AI. That’s all. But this story has so much more and I wasn’t expecting that. And there were lots of evil and genius twists and turns and I could only sit there in complete awe while reading, slightly dazed by all the awesomeness. So I’m not going to go deeper into the plot, so you can feel the same awe in case you still have to read this yourself. The humor. Yes, you heard me right. This sci-fi, action-filled, creepy-as-hell book was funny. Really funny, actually. I felt like the humor was just the right balance with all the death and chaos and tears and mayhem, to help you get through it all. Seriously, I’m so berating myself for not having picked this one up sooner. I really need to read outside of my comfort zone more often, if it means I could pick up some other gems like this one. I’ll definitely be continuing this story with Gemina as soon as possible! “Interviewer: So. Tell me about your mother. Ezra: You’re taping this, right? Ezra: Okay, well for the benefit of the sight-impaired, I am now raising my… oh, dear… yes, it’s my MIDDLE finger at Mr. Postgrad here. Ezra: Now I’m wiggling it. “Can’t I?” Zhang’s eyes are wide now, gleaming with something new—a kind of madness to match the computer’s. Not the look you want to see on the face of an enemy as intelligent as this one. Have you read Illuminae? What did you think about it? YAY!!! So glad you got to this and loved it!!! I put it off like you did and was so made I waited so long. Lovely review!! Haha, OMG I felt the same way before starting this, but I’m so happy I finally picked it up! Aaah, I am in doubt about starting Gemina. On the one hand, I want to read it ASAP, but on the other hand I want to wait a bit because the wait for Obsidio is still sooo long…. Choices, choices… Did you already read Gemina? Great review! I’m dying to read this one! Amy @ A Magical World of Words recently posted…A Blog Squad Special: A Tag! I have read this and OMG YOUR BLOG POST TITLE IS THE BEST! I really enjoyed it but it was a little overhyped for me! Anyway, thanks so much for the review Lindsey and it’s really great to hear you enjoyed it! Haha, thanks so much 🙂 Yes, I can totally understand how the massive hype could easily harm the reading experience for this one! Too much hype is never good. Haha, yes I felt like I was one of the last persons in the galaxy who hadn’t read it yet, so I’m happy that I finally read it AND that I liked it as much as I did 🙂 I really hope you’ll enjoy this one just as much as I did! THIS MAKES ME SO HAPPY!!!!!! AHHHHHH. I’M SO GLAD YOU LOVED IT 😀 😀 How amazing was it??? I thought I might not be able to connect with things because of the format but NOPE. I loved everything and everyone SO much. I have a bunch of conflicted feelings about AIDAN too. Like I hate them, but I love them??? I can’t wait to see what you think of Gemina ♥ Great review, Lindsey!! I totally understand what you mean when you say you thought that the format of this book would make it really hard to connect with the characters! I thought the same thing at first. I still thought it until about 1/4 of the way through. This series is just amazing! AIDAN is my faaaavourite villain ever. He was terrifying yet so freaking awesome. I’m sure we’ll see him again. You definitely have to read Gemina soon! Although the story line is a bit similar, but it’s still so much fun to read. And I love the science in Gemina. AIDAN is so amazing, I definitely hope we’ll see him again! Haha, I am also a total hipster with this. I mean, if people tell me TO READ SOMETHING, I will just not. Eventually, maybe… But yeah. If it’s too popular, it CAN’T be good. Sound logic, huh? 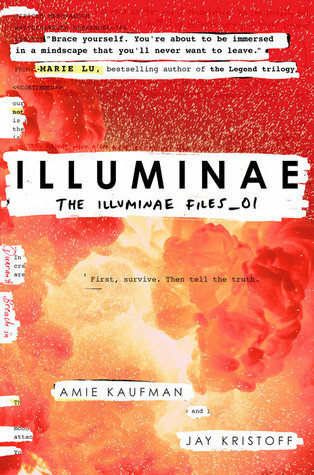 The thing with me and Illuminae was that I… didn’t even know about it o_o I happened to join the blogging picture just as everyone was going mad about Gemina, so that’s how I found out about Illuminae, and eventually read it. Totally loved it though. Waiting for my Gemina copy currently.